We have a selection of 43 remarkable articles in 11 countries in January 2015: Australia, Austria, China, Finland, France, Germany, Italy, Slovenia, Spain, UK, USA. Australia: New legislation will replicate key aspects of the British regime that seeks to encourage stock options in small companies and start-ups. Austria: An employee ownership foundation for the Austrian Post? China: Employee share ownership plans are widely seen as important mechanisms in reforming China's state-owned enterprises. Finland: Due to new fiscal incentives, employee share funds increased more in 2014 than during the five preceding years. France: Successful new plans for GDF Suez, for Cap Gemini, for Peugeot. MBO/EBO for Movitex. The new legislation will ensure better governance of employee share funds. Workers co-operatives in France: Global picture and some particular cases. First election of the Supervisory Board for Cap'Orange. Germany: Employee shareholders refuse the discharge to Siemens Supervisory Board. Italy: New employee shareholders association for Banca Carige. Workers Buyouts in Italy. Slovenia: Minister of Economic Development promotes employee ownership. 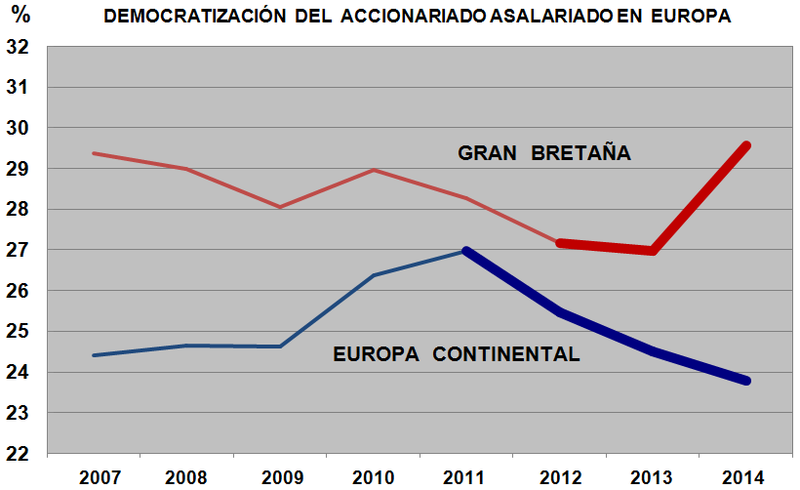 Spain: Paving the way for the development of employee share ownership in Spain. UK: Employee Ownership Trust (EOT) was introduced by the Finance Act in April this year as an innovative way of encouraging businesses to become employee owned through enhanced tax benefits. Circle was founded as a part-employee owned business in 2004, but its image was damaged last September. Why every company should offer their workers a save-as-you-earn share plan. USA: Is an ESOP a good idea? Numerous new ESOP companies.